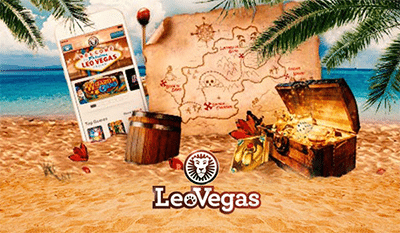 LeoVegas Casino is a respected online casino with a 200% deposit bonus for new customers. The casino has a great selection of real money games, including many pokies and table games. This review will run you through everything you need to know about Leo Vegas, including extensive detail about the latest bonuses and promotions for Australians. Leo Vegas has a tantalising welcome package available for new players, with up to $1000 in bonus money available over your first four deposits. Firstly, just signing up for an account will earn you 20 free spins, with no deposit required. Move on to make a real money deposit and you’ll receive a 200% matched deposit bonus up to a value of $100, plus an additional 180 free spins – 200 free spins in total. Free spins can be used on Starburst, Vegas Party and Drive: Multiplier Mayhem, which are some of Leo’s most popular online pokies. Leo Vegas is constantly unveiling new promos, comps and rewards, so bookmark the site and check back regularly to see what awesome new bonuses are up for grabs. We highly recommend signing up with the casino to receive email notifications to stay in the loop of all the latest promotions and receive exclusive bonus offers only available to registered members. In the past we’ve seen such promos as pokies tournaments, free spins for new games, boosted deposit bonuses, leaderboard challenges and real world prizes which have included Apple gadgets and all-expenses paid holidays. Euro Championships Blackjack Promo: As an example of what to expect, the latest promo running at Leo Vegas in June is the Euro Championship Blackjack competition. From the 11th to the 22nd of June, every time you join the live dealer Celebrity Blackjack Party table inside the Leo Vegas Chambre Séparée and are dealt a player card, you’ll receive a free $10 cash prize deposited to your account the next day. If a star player shirt card is dealt, every player seated at the table receives an additional $10 cash prize. Leo Vegas Treasure Hunt – for the entire month of April, Leo Vegas ran a huge treasure chest promo, with an epic $100,000 in prizes to giveaway. Prizes were awarded to players who assumed the top positions on the weekly leaderboards, earned by triggering free spins and bonus rounds while playing selected pokies games. Top prizes awarded to individuals included $10,000 cash and Apple iPhones and iPads. Rock ‘N’ Reel Promo – to celebrate the launch of NetEnt’s Guns N’ Roses pokies game, Leo Vegas gave away one of the biggest prizes we’ve ever seen from an online casino. The star studded grand prize included return flights for two to San Francisco and Los Angeles, accommodation at five-star hotels, tickets to a show at Johnny Depp’s famous nightclub The Viper Room, guitar lessons with musical guru Joe Satriani, dinner at The Hard Rock Café and a ride on a Harley Davidson motorcycle. Runners up received prizes including concert tickets, PlayStation 4 video game consoles, Go Pro video cameras, Apple mobile devices, iTunes vouchers and free spins. Christmas Cash Countdown – last Christmas, Leo rewarded its players with a $100,000 cash giveaway, where players earned one ticket to the prize draw for every $10 of real money wagered at the casino. The top prize was $25,000 in cash, while 50 second runners-up received $1,000 cash and 250 third runners-up received $100 cash. Sound like the kind of promotions you want to be a part of? Sign up now at Leo Vegas Casino and click ‘yes’ when asked if you want to subscribe to regular updates. The monthly VIP prize draw provides a chance to scoop up such rewards as cash, Apple products, tickets to VIP event experiences and loads more. One of the best monthly draws we’ve seen was the Leo Vegas VIP Summer Sports Bag which had all kinds of treats including a Fitbit Sportswatch Blaze, which was granted to one lucky player from each VIP level. Unless otherwise stated, all bonuses at Leo Vegas come with a 35X wagering requirement before you can withdraw any winnings made from bonus money. This means you need to play the amount of your bonus through 35 times before you are actually able to take any of the cash you made from your bonus money. This is a pretty standard wagering requirement across the board, and while it may sound harsh, it’s easy to hit if you play at the site regularly. Leo Vegas do a pretty good job at clearly laying down the rules of their bonus offers, so always check the terms and conditions of any bonus offer to avoid any disappointment. The 200% welcome bonus with 200 free spins has been the standard welcome bonus available at Leo Vegas for as long as we can remember, so it’s safe to say the promo is solid and not expected to change regularly. The one-off promos, on the other hand, change weekly and/or monthly, with all exclusive promotions available for a limited time only. Leo Vegas has a good reputation for providing prompt and reliable player payouts and we couldn’t find any records of payment disputes with the site. Be aware you will need to provide proof of identification, address and payment method before you can withdraw any winnings, and you’re only allowed one free withdrawal per month – any more and your withdrawal will be subject to a small processing fee. What games can I play at Leo Vegas? Pokies – Starburst, Dazzle Me, Big Bad Wolf, Jimi Hendrix, Aloha Cluster Pays, Guns N’ Roses, Drive: Multiplier Mayhem, Nirvana, Taco Brothers, Gonzo’s Quest, Razortooth, Game of Thrones, Jurassic Park. Table games – American Blackjack, Blackjack Pro Series, Baccarat Pro Series, Casino Hold’em, European Roulette, American Roulette, Pai Gow Poker, Double Exposure Blackjack, Perfect Pairs Blackjack, French Roulette. Live dealer games – Live Auto Roulette, Live Baccarat Squeeze, Live Celebrity Blackjack Party, Live Common Draw Blackjack, Live Caribbean Stud Poker, Live Ra Roulette, Live Three Card Poker, Live Blackjack Party, Live RIP Roulette. The Leo Vegas mobile casino has won numerous awards and is arguably the best mobile casino available for Aussie players. Games are available for instant-play directly over your mobile web browser, while a native app is available to download for both Apple and Android users. There are no bonus offers available exclusively for mobile users, but all the same great promotional offers are also available via mobile site, so you can reap the rewards whichever way you choose to play. 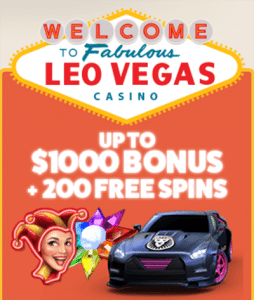 Sign up for an account with Leo Vegas Casino today and claim your welcome package of 200 free spins and a 200% matched deposit bonus, with up to $1,000 in bonus money available over your first four deposits.